Oh I can't believe I forgot to write this post! Well, that goes to show how out of control life got last week. I'm glad that's over. At least there is a second reveal at Sketches in Thyme using the same sketch, #112. When I first saw the sketch, I panicked. I use primarily 4x6 photos. This is out of my box! However, I also knew right away what photos I would use. For those that are new to me and my blog, my son has special needs. This is a milestone for him, and an incredibly important one. He has finally figured out pointing with one finger, something he has not been able to do until very recently. This quite literally, puts the world at his fingertips. I am so happy I was able to grab a few quick shots before we left for school. He opened the book and pointed to quite a few animals on the pages. I tried to capture the action as well as some of him. I think I did that. I tried to keep this fairly simple. The sketch itself has a lot going on. I only used 2 papers. The rest is washi tape and die cuts. And really, I tried to keep the focus on the photos. I used the arrows to move the story across the page. 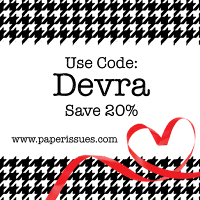 I am hoping you'll stop by Sketches in Thyme and join in the fun. Yes, that's right, three posts today. Please go here if you are looking for the 5/15 About a Boy challenge. Please go here if you are looking for the 5/15 Sketches with Color challenge. This next page was designed with a few things in mind. First, it's Craft Challenge reveal time at Child's Play Challenges. This time, an item I can seriously relate to....BUTTONS! Buttons, buttons everywhere. Not really, but there are quite a few on my page. Buttons are probably the most versatile of all scrappy embellishments. Use them as is, with thread, alter them, create shapes, banners, and they don't even have to be all the same....But that's just my opinion. I'm weird. Sometimes I get an idea in my head and I just have to find a way to do it. On this page, it was the buttons as sun rays. I know the sun is large, but it made me so happy while I was creating it. I decided to also use some washi, but it was so transparent, I needed to add something, so I sewed down the middle of each washi ray. Regardless, the rays point to the title, photo and journaling. So I think it all works. I began this page by looking through some sketches. This page is inspired by Inspired Blueprints #91. 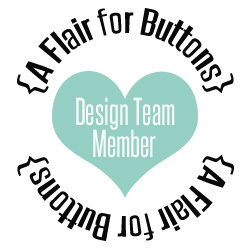 Well, I hope to see you playing with buttons at Child's Play Challenges and with patterned paper at Club Ck this week! Please go here for 5/15 About a Boy post. Please go here for 5/15 Child's Play Challenges post. Welcome to my Wednesday writing frenzy. I have 3 reveals today! I'm really excited about them all too! I am thoroughly enjoying Sketches With Color. I'm going to keep saying it, but using a sketch and a color scheme is stretching my creative mojo. I really encourage you to try it out. These are becoming some of my favorite pages I've made recently. This month we are using the Pantone color palette, and choosing three colors for our LOs. I used linen, monaco blue and sunflower, with a touch of nectarine for some contrast. This page is quite a departure for me. I used flowers! And there is a bug on the paper too! And there is not red, or green on the page! These papers and embellishments were given to me as part of a monthly class I take at my LSS. I enjoy being able to use things I don't ordinarily use. This was no exception. I looked at these items and immediately knew how I wanted to use them. I thought they were perfect for this reveal. The colors are pretty together and set the mood with the photo. I've had this photo sitting around my desk for a awhile. My aunt passed away shortly after it was taken. It turned out to be a beautiful way to remember her. Hopefully I'll see you over at Sketches With Color. Find your colors to set the mood for your LO's too. Good Wednesday to you! Today is a packed scrappy day for me. I have 3 reveals for you, which actually means 3 different posts! Be sure to check them all. I'm pretty happy with my creations. 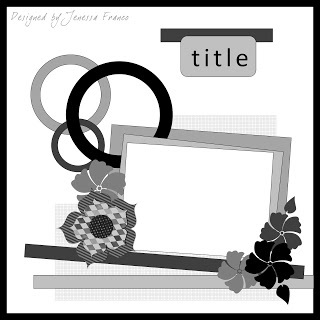 I think I'll go alphabetically, so that means I'll begin with my page for the newest About a Boy challenge: create a page using only White and one other color. I had already chosen this photo. It's another great one that my sister took. It's quirky, like the expression on his face as well as the mood he was in. Because his shirt is navy, I could pretty much choose any color to complement the photo. I have been pushing myself to go beyond my obvious. So I decided not to use red, green or blue and went with ORANGE! I found this fabulous sketch over at Pagemaps, and the rest was easy peasy. Ok, I had to decide how much orange was too much and scale back on the embellishments. I tried to let the papers and the photos speak for themselves, without overwhelming them with extra orange bits! I hope you will create and share something at About a Boy , using the idea of white and one color to highlight something about your boy. The photos are of the tulips in my garden, This is the first time in my life, I've had a flower garden. But if you know me, I have neither the interest nor the time for gardening. I don't do dirt and bugs. I just like to enjoy the flowers. So tulips are kind of perfect for me. Fairly low maintenance, except for chasing the bunnies away. I kept the sketch the same, but added a few extra embellishments. This is a bit of a departure for me in a couple of ways. First, I use mostly 4x6 photos. I challenged myself NOT to go ahead and do that here, and instead printed these out in 3x4. (I am finding it so much easier to do now that I have my little photo printer). 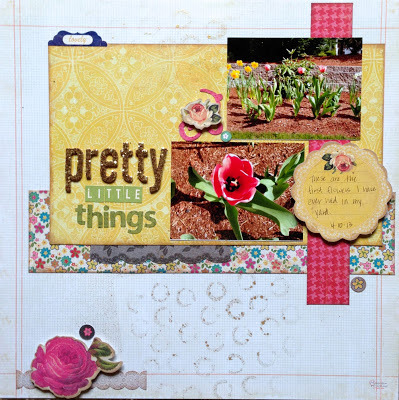 Second, I chose to do a very "girly" page, using flowers as the subject, but also in the paper selection. And pink. Lots of pink. This is something I don't do often, as most of my pages are about my two boys. It was fun to play with "pretty little things". 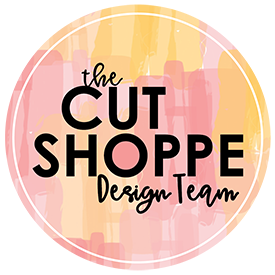 I hope you will join us this week over at Sketches in Thyme. For a long time, I had admired the Sketches in Thyme blog, but hadn't played along. Well, a few months ago, I finally began to play and I haven't looked back since. I love their sketches! Recently, there was a Design Team call so I decided to apply. 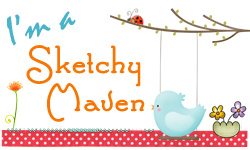 I am so thrilled to announce that I was asked to join the team as a Sketchy Maven! I am excited to be a part of this talented team. I truly hope you will join in the fun at Sketches in Thyme, and use some of these great sketches to inspire you as they have me!